You know the crispness that Fall brings is just around the corner when pumpkin recipes start flooding the internet. Pumpkin is so delicious in baked goods, but it is also a powerhouse when it comes to nutrition, making it a perfect ingredient for a Fall smoothie. 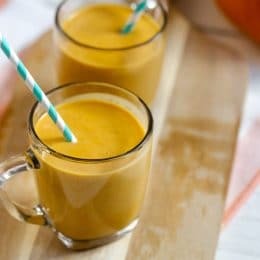 This smoothie is like drinking pumpkin pie, except for a lot less sugar and a great boost to start your kid’s day! And for those of you with children who have dairy allergies, we made it dairy free! 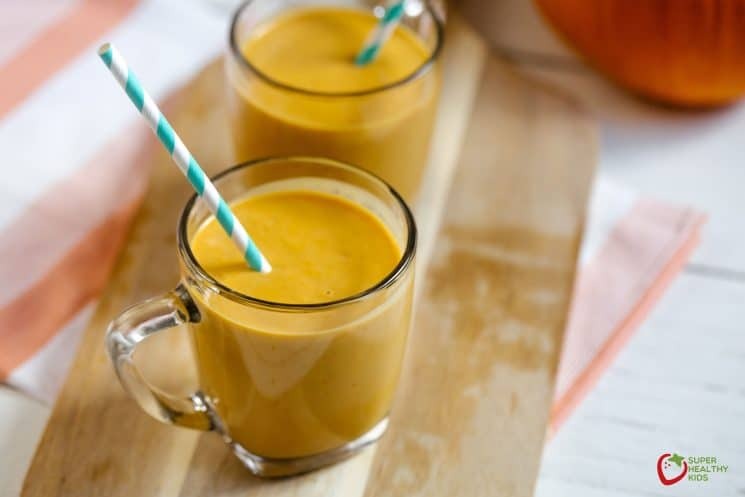 The great thing about this Dairy-Free Creamy Pumpkin Smoothie Recipe is that you can substitute dairy for non-dairy and vice versa depending on your needs. 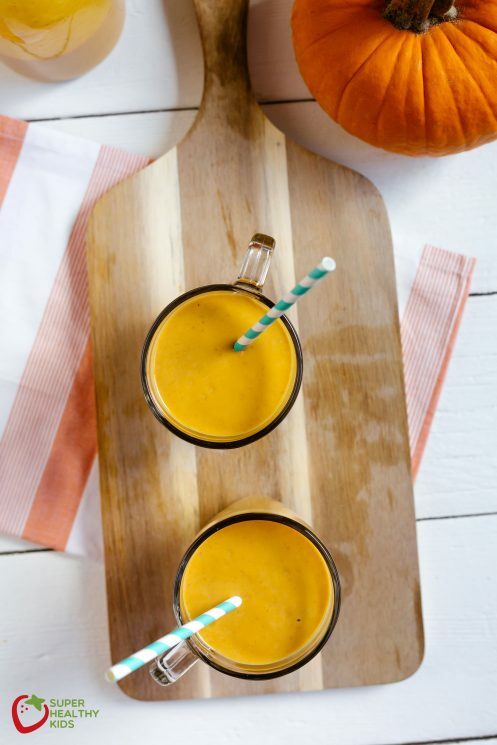 So why add pumpkin to your morning smoothie?? It contains a lot of vitamin-A, providing about 246% of RDA. Vitamin A is a powerful natural anti-oxidant and is required by the body for maintaining the integrity of skin and is also an essential vitamin for good visual sight. 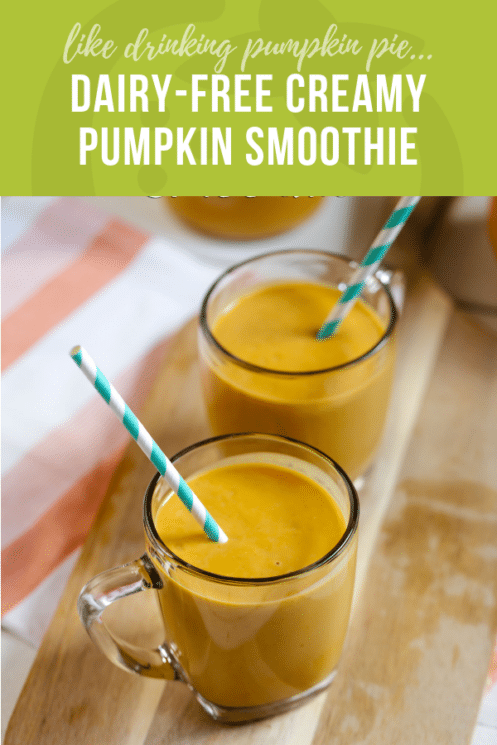 Pumpkin is a great source of fiber with three grams per one-cup serving and only 49 calories, it can keep you feeling full for longer on fewer calories. 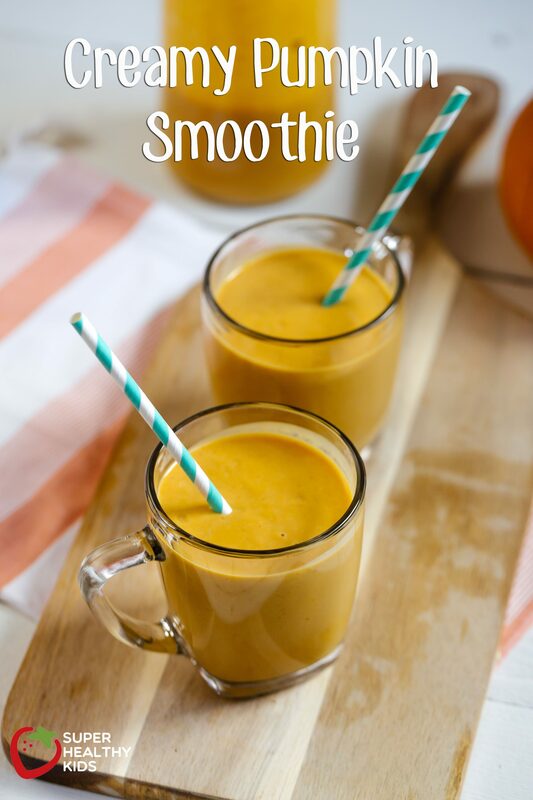 Pumpkin contains more potassium than a banana with 560mg in one cup of cooked pumpkin! Potassium can help restore electrolytes and maintain fluids in your body after a good workout. That ensures your muscles recover properly and helps you avoid cramping. High in Inflammatory Reducing Beta-Cryptoxanthin and Beta-Carotene. Both of these are powerful antioxidants that help prevent inflammatory disease and strengthen your immune system. Plus let’s be honest – it tastes amazing!! Nothing says fall like pumpkin, and so why not add into your day first thing? To make this dairy free, we used Silk%20Pure%20Almond%20Vanilla,%2032-Ounce%20(Pack%20of%206) Almond Milk and Coconut Milk Yogurt in this smoothie. If you haven’t tried coconut milk yogurt, it is a great alternative to Greek yogurt. It is thick and creamy just like Greek yogurt, but dairy-free! Blend all of your ingredients together until smooth and creamy. Serve cold with fun straws for your kids! Can you sneak a cup of veggies in here without changing the taste too much! Say maybe spinach or arugula? Can you sub rice milk for almond milk? No tree nuts! Coconut is not considered a tree nut. Thanks! Can you use regular milk and Greek yogurt? Wonder if it will taste the same? It should Rachel- the pumpkin pie spice, maple and banana have stronger flavors than the milk. Sure Gran Ann- rice milk will work. Pumpkin, as with other plant foods, contains no vitamin A at all. Vitamin A is retinol. Pumpkin contains carotenes, especially beta-carotene. If you’re relying on BC to provide vitamin A in a child five years old or younger, they’re not getting any vitamin A at all because a child 5 or under can’t convert beta carotene. If they’re older than five and have certain health conditions, such as diabetes or thyroid problems, they can’t make the conversion either, and some people are just naturally bad at making the conversion no matter what their health situation is. No one tests for this, so if you rely ONLY on BC, you are taking serious risks. I mention this everywhere I see the nutrient discussed because our government has done us a real disservice treating the two nutrients as one and the same, and dietitians and nutritionists usually echo that sentiment uncritically without looking at the science. 2. Dental problems. It’s not “baby bottle decay,” it’s poor enamel development (mediated by A). 3. Mayo Clinic says the number one most common class of birth defects is urinary tract defects. Kidney and ureter development are mediated by vitamin A. And that’s just for starters. A lot of our reproductive problems come not from advanced age at the birth of the first child but from poor fat-soluble-vitamin nutrition throughout the adult life. Lack of vitamin A in fact is a major offender and can lead to abnormally heavy menstrual bleeding that in the past has led physicians to prescribe hysterectomy, even though menorrhagia is regularly cured by vitamin A supplements in the developing world. Just scratching the surface here, be careful what you claim about foods. Iknow this is am old comment, but.. Thank you, Dana. This information was more than the dietitian gave me for my son. Thanks for the info Dana! Love this recipe and can’t wait to make it for an after-school snack! Would this be suitable as a breakfast idea for a 14 month old? She has a dairy allergy so we are limited so this looks great. its more beneficial for you to post the problem with some solutions Dana. where can we get vitamin a for kiddos younger than 5? How many servings does this recipe make and what are the calories per serving? Confused? Greek yogurt and still dairy free? So sorry about that one – it is a mistake in the recipe. We will get it changed!